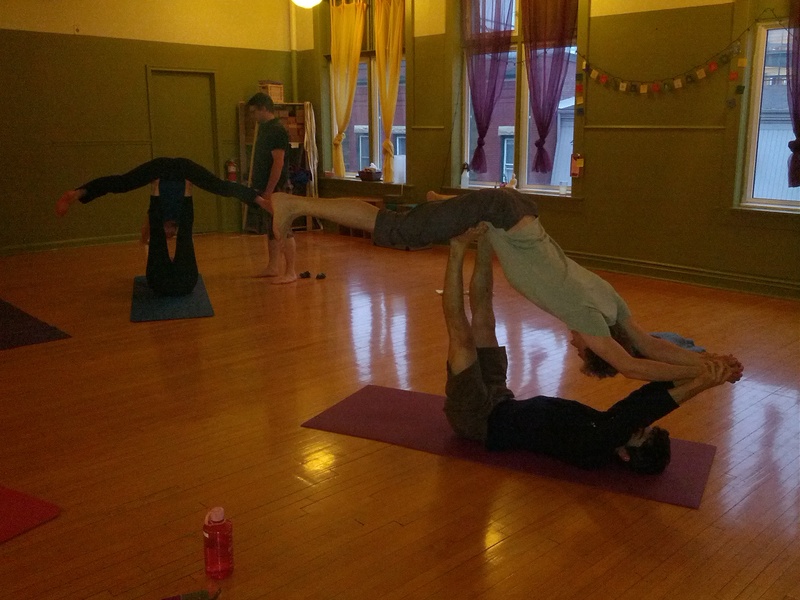 I went to my first Acro Yoga class last week. After seeing Leena and Emma’s faces light up when they talked about it, I thought it just had to be a wonderful thing to try! I feel like Acro Yoga is like a jacked up version of some trust game you might play at the beginning of a company retreat or something. The trust that you need to put in the other person that is lifting you up into the air is incredible, and also the personal boundaries that are crossed when you let a stranger put their hands and feet on you and push you up is something else as well. But wait, I think I’m getting a little ahead of myself. You may still be wondering, what is Acro Yoga? As the name surmises, Acro Yoga is a combination of acrobatics and yoga. Moves are done in pairs, and it’s pretty highly advisable to do them with a spotter. One person is called the Base and they lie on their backs and lift their partner, the Flyer into the air. I was tempted to say that the Base does a lot of the heavy lifting, but given how sore I am right now (3 days later) I will simply say that there are certainly efforts made on both sides to make things happen. Coming into the class I really liked that it was small and personal so you really had the chance to get to know your partner and think about what you were doing. While yoga certainly is about your own experience and practice, I can’t help but feel like I need to keep up in a larger class, rather than remain or work on a pose just a little longer if it’s something that I’m struggling with or would like to fine tune. After warming up we started with some basic poses. The first was just getting used to the idea of letting your weight fall onto your partner’s legs and letting them hold you up. I’d say this exercise was on par with that trust exercise where you close your eyes in the middle of a circle of people and fall, trusting that they will catch you. It took me a few times to not tense up as I let my weight rest on my partner’s legs. From there we moved on to a simple lift, called Front Bird. Like I do in any situation when I’m nervous and excited, I laughed. All at once this pose was exhilarating, nerve-racking, challenging and confusing, but the support and encouragement that was offered in that classroom made every single one of those feelings ok. Even when I fumbled and almost dropped Leena when I was doing base, it was ok, we laughed, and we tried again. Again and again my boundaries about what I thought I could do with my body, not to mention what someone else could help me do with my body were surpassed. By the end I didn’t feel any hesitation about trying the next thing, not only because I was gaining more insight and familiarity with what I was able to do but also because I knew the people that I was with would be supportive and help me when I stumbled. Having spoken to people since being in the class I’ve often been met with, I don’t like heights, or I’m too old for that, or I’m not fond of acrobatics (I haven’t met many people who’ve even attempted acrobatics so I was a little suspicious of that one). Acro Yoga certainly falls outside of what a lot of people are comfortable and familiar with doing. The word Acro certainly insights the thought of quick and risky movements, and certainly it can get closer to that end for more experienced practitioners, but I really couldn’t have felt safer with that group of people. Like the yoga that most of us know and love, Acro Yoga meets you at your level and you can take it along step by step. To anyone out there that is wondering whether or not they should try it, I would highly recommend the experience. For those of you focused on the fitness side of yoga, it is an incredible workout. I haven’t had my whole body hurt this much in a long time, muscles I didn’t even know I had are definitely letting themselves be known! It’s all good though, I know I’ll be stronger for the next round of fun!. For those of you concerned with the introspective side, it certainly is cause for thought in terms of your personal boundaries, physical and mental. For those who are just out to have a good time, well this is definitely your yoga! This post was written by our work trade Tegan, who in her spare time if she’s not blogging, tweeting or facebooking for QSY also enjoys (among other things) taking her dog for walks in the tall grasses of spring.